Last month, members of civil society met in Honduras to discuss Honduras’s relationship with the ICC, including the status of the Court’s preliminary examination into alleged crimes arising from the country’s 2009 coup. The discussion occurred during a public forum organized by the Coalition and Centro de Investigación y Promoción de Derechos Humanos (CIPRODEH) in order to promote awareness of the ICC and its mandate, in addition to the Rome Statute’s role in promoting national investigations and prosecutions of the crimes enumerated in the Statute. The promotion of national investigations is of particular relevance to Honduras, where the ICC prosecutor has been conducting a preliminary examination since 2010. The examination is focused on alleged crimes committed in the aftermath of a 29 June 2009 coup d’état, as well as events surrounding the post-election period the following November. 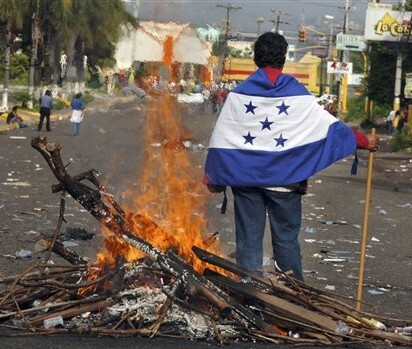 The coup saw Honduras’s then president, Manuel Zelaya, deposed by the Honduran army. Zelaya had been planning to hold a referendum to rewrite the country’s constitution. In the wake of Zelaya’s ousting, the interim government passed several repressive emergency measures, and civil society reported that excessive force was used against Zelaya supporters and others. The Inter-American Commission on Human Rights documented a number of violations, including excessive use of force, arbitrary detention, sexual violence, deaths and possible disappearances. The ICC prosecutor is currently looking into whether those alleged abuses could amount to crimes against humanity as defined by the Rome Statute. During the public forum, as well as a number of workshops held with civil society last month, civil society and other actors discussed the status and scope of the preliminary examination, as well as the conclusions found within the Office of the Prosecutor’s (OTP) 2013 report on preliminary examinations. Following the public forum, CIPRODEH, the Committee of Relatives of the Detained and Disappeared in Honduras and the International Federation for Human Rights held a press conference and urged national judicial authorities to investigate and prosecute perpetrators of gross human rights violations. The Coalition called for Honduras to pass legislation that would incorporate Rome Statute crimes and principles within domestic legislation and allow for increased cooperation with the ICC. A week before the forum, an OTP team visited the country, signaling that although the prosecutor’s office has yet to prove that crimes against humanity occurred in Honduras, it has yet to conclude its examination. Highlighting the concerns of local civil society groups, the Coalition encouraged the continued flow of information between civil society and the OTP as it continues its work in Honduras.